Much of the psychotherapeutic establishment now regards the therapy as marginal. A 2006 article by Dr. Norcross and colleagues in the journal Professional Psychology: Research and Practice reported that their survey of more than 100 “leading mental health professionals” had found primal therapy to be “certainly discredited” — together with treatments including angel therapy, crystal healing, past-lives therapy, future-lives therapy and post-alien-abduction therapy. Those are pretty strong words. After all, if you deem something to be “discredited” you should have extensive evidence to back it up, right? This survey enrolled 101 so-called mental health experts to assess 59 treatments by questionnaire. “Experts” were decided by criteria such as doctorate-level education, fellows of the American Psychological Association (APA) or American Psychological Society (APS), current and former editors of scholarly journals in mental health, members of the APA Presidential Task Force on Evidence-Based Practice, and chairs or editors of the Diagnostic and Statistical Manual of Mental Disorders (DSM). In other words, no one who had ever practiced primal therapy was included. Overall, 66% of respondents were supporters of cognitive behavioral therapy (CBT) or “eclectic/integrative” therapy. In other words, these “experts” represented the dominant wing of the psychological establishment, which has always been critical of primal therapy and the notion of repressed memory. We operationally define discredited as those unable to consistently generate treatment outcomes (treatments)…beyond that obtained by the passage of time alone, expectancy, base rates, or credible placebo. Discredited subsumes ineffective and detrimental interventions but forms a broader and more inclusive characterization. We are interested in identifying disproven practices. Stunning ignorance, I know. But take a deep breath. In all the therapies listed, except the cognitively based therapies, cognitive behavioral therapists were more likely to rate them as discredited. Not only that, but most of these “experts” were not even familiar with many of the treatments. And yet they felt competent to judge them. With regard to “primal scream therapy,” 6% were not familiar with the therapy. Actually, I would say zero percent were familiar with the therapy because it is not called primal scream therapy! Nowhere is the “evidence” mentioned that substantiates these “expert’” decisions. I assume they just cherry picked whatever papers fit their therapeutic orientation, or perhaps they just gathered around their virtual water cooler and made up that “professional consensus.” As for “primal scream therapy” they had obviously done no research to find out that primal therapy has nothing to do with screaming. So this is the sort of misinformation about primal therapy that is circulating around the psychological community and the mainstream press. Decades ago, Art Janov decided to distance himself from the mental health establishment for this very reason. Despite his many efforts to convince his colleagues that his therapy worked, he was met with ridicule and outright defamation. Since then, primal therapy has existed on its own, quietly advancing as the decades have passed, and some respected psychologists, physicians, and neuroscientists have come to appreciate its effectiveness: Louis Cozolino, Justin Feinstein, Jaak Panksepp, Paul Thompson, and Gabor Maté, to name a few. And although the therapy still needs to be researched, it will be done without the participation of these “expert” clowns. 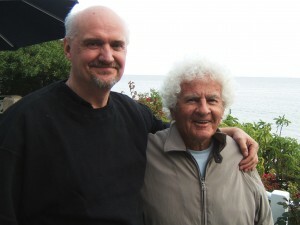 Three days ago, the world lost one of the greatest psychologists of the past century, Dr. Arthur Janov, originator of primal therapy and Director of the Janov Primal Center in Santa Monica, California. I first “met” Janov on the front cover of his groundbreaking book, The Primal Scream (1970). I was 21 and deeply troubled and there he was with his dark eyes, handsome face, and curly hair, looking totally relaxed, promising hope. I had heard he had treated John Lennon and Yoko, and Lennon’s primal album was one of the most gut wrenching pieces of music that I had ever heard. There was no doubt when I read Janov’s book that primal therapy was exactly the treatment I needed to get better. In 1974, I entered into therapy at the Denver Primal Center and have never regretted it. Today, I am having another round of treatment at Janov’s centre in Santa Monica, all to good effect. I will be blogging more on this in coming weeks. In recent years, I became closer to Art (the name he preferred among his friends), offering to help him advance his therapy in the scientific community. He took up the offer wholeheartedly but he was pretty skeptical of anything coming of it. After all, he had gone through decades of ridicule and abuse in both the psychological and psychiatric communities. My best memory during this period was introducing Art to Jaak Panksepp, another giant in the field of affective neuroscience. Panksepp immediately recognized the logic of primal therapy – that early life trauma can have lifelong consequences – as he had observed himself in his animal studies. Although the two never went on to collaborate (sadly), Panksepp was profoundly affected by primal and went on to talk about it in conferences and in his books. After being ignored by almost every scientist Art reached out to, this was a real bonus for him. Art and Panksepp stayed in touch over the years, right up to the Panksepp’s untimely death earlier this year (April 18). The only hope for cohesion, and lasting help for patients, is to address the generating sources of neurosis or mental illness. What and where are these sources? I believe that the conflict between the imprinted Pain of early trauma and its repression is the central contradiction that generates neurotic reactions both internally (physiologically) and externally in the form of behavior. Repression, or the loss of access to feelings and sensations, is an evolved function that allows us to survive unmitigated pain early in life. The pain, however, stays in the body, unavoidably – as unavoidable as the experiences that originally caused the pain. And the pain will perpetually fuel a dislocation of mental and physical functioning to keep itself unfelt, for as long as it remains unfelt. Throughout his career, Art held fast to these principles, reiterated time and again in fifteen books, plus a large number of blog posts. Today, primal therapy is exact and measured, a far cry from the primal of early days. Patients are followed closely from the beginning with physiological measurements (heart rate, blood pressure, body temperature), and many of the patients at the center (including me) are taught to “regroove” their feeling style so that later, higher level feelings are fully felt and integrated before lower, earlier “first line” feelings are allowed to surge forth. Art was always adamant that primal therapy should proceed in an orderly and coherent manner, with later feelings going first and earlier feelings following. I now see the wisdom in this, as it helps one to connect and integrate feelings and prevents first line overload. And so I have done so. Dear Art, rest in peace my friend. You have done more for me than you can imagine, and continue to do so through your books and blog. Thank you.